The issue of how we use social media for our own development as teachers and as digitally skilled individuals, is one that I believe is of vital importance though, not just because it can enable us to keep developing as teachers through the content, ideas, resources and above all people it gives us access to, but also because the way use digital media for our own development should guide and influence the way we use it with our students and build their digital literacies and communication skills. So here it is. This my own attempt to outline my digital media learning experience, or at least part of it. One of my favourite and most useful sources of information is Diigo. What I particularly like about Diigo is the groups. As you can see here I’m a member of quite a few groups. The thing that I really like about the groups is that each group is set to send me a daily digest of any links shared within that group, so looking through these email digests is usually one of the first things I do at the beginning of each working day. These groups have really provided a very rich source of professional development for me and most of the interesting articles I read originate from here. I also have a range of RSS readers for my different devices and these keep me up to date on the blogs and journals I follow. I’ve been using Netvibes for quite some for this, but on my mobile devices I also use Flipboard for more general information and Zite for more professional things. This video shows how Zite works. Both these are very easy to browse when I have a moment spare and have great integration with both Twitter and Facebook. 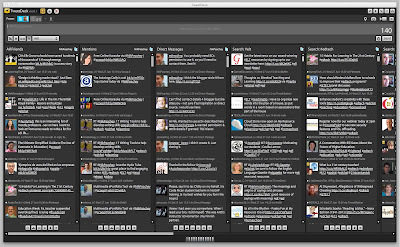 Apart from those I also use Tweet Deck to follow specific topics on Twitter. 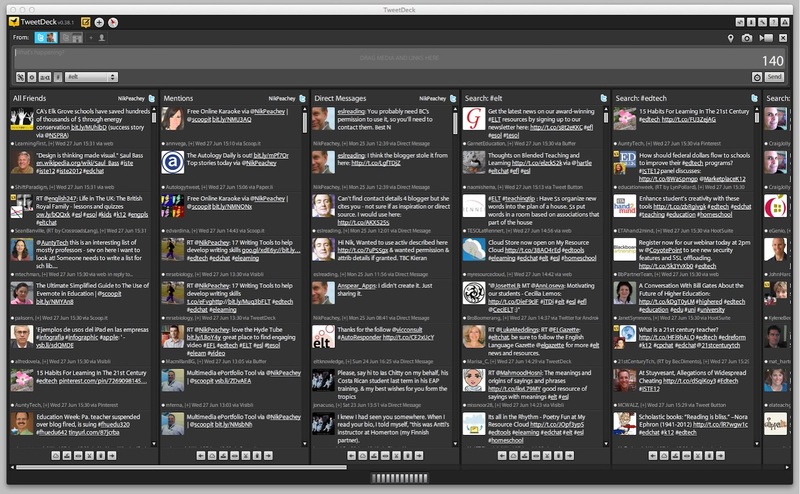 I have it set up so that I can monitor the most useful hashtag related streams when ever I have some down time. It’s really easy to spend a lot of time sorting through information and links to articles, only to discover a few weeks later that you can neither remember or find anything you looked at, so i use a whole range of tools to make sure I capture and attempt to digest all this information. For a while I used a great visual bookmarking tool called SimplyBox, but unfortunately that disappeared, so I was left to resort through all my link there and find better solutions (never a bed thing). My solution has been to spread things out a little. I’ve been collecting a lot of infographics recently and I find the Pinterest is the ideal tool for these. It’s easy to collect and save them using the browser bookmarklet and they display well when I want to search through and find the ones I need. 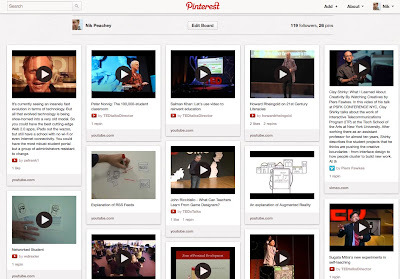 I’ve also found that Pinterest is great for collecting YouTube videos and this has been a great way to access the videos when I need them. Though sadly, although Pinterest grabs YouTube videos well it struggles with other web based video embeds, so I might have to look for something better for that. For a long time I had all my links to useful web tools and resources stored in boxes on SimplyBox and it has taken a while for me to find a replacement for this. I have tried publishing my favourite tools for learners using a Scoop.it site. Although this is a nice way to share the tools it isn’t so handy when I come back to find them again. The answer to my problem came a few weeks ago when I discovered Meaki. 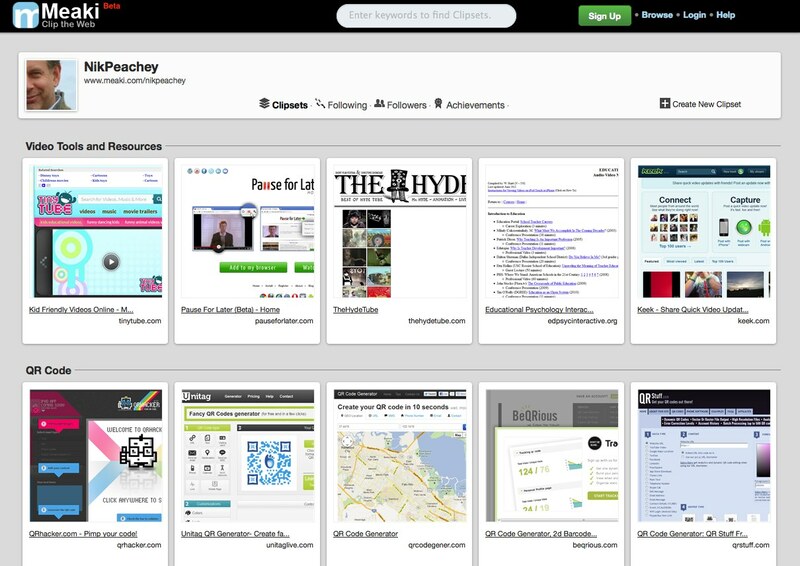 This process of curation (sifting and organising links to useful content) may seem a little time consuming, but it doesn’t have to be. Once the initial sites are set up, you can just use any short bursts of 5 or 10 minutes either at the start or end of the day or between lesson or other tasks. Let’s face it many of us find time for facebook in those short moments so why not something more productive? Of course the most important part of processing all this information and making use of it is to put it into practice in my teaching, training and very importantly my writing. Trying to synergise all this information, make sense of it and formulate it into a rational strategy for moving my development forward is something I couldn’t do without blogging. The act of writing something down and organising it into a rational readable text on a blog to be published for others in your profession to see can really help you to focus on and confront your own ideas and beliefs and many postings that I have started to write have ended up in the rubbish purely because the act of putting those ideas into text convinced me that was where they belonged. So having been through this process or collection, analysis, curation and reformulation the final step is to start to share those ideas. Sharing is a really important part of the process. It’s important because if you create something of value that can help you develop it can probably help others develop too. It’s also important because you can get some feedback from other teachers, perhaps even a little encouragement and appreciation and start to grow your network. The Tumblr site, is something I’ve only started using quite recently, and only really to back up all those articles, so that if Scoop.it disappears or decides to start charging large amounts of money I haven’t completely lost everything. As I said Scoop.it posts straight through to Twitter, which I mentioned earlier is also a great source of information in. I tend not to engage with people very much through Twitter though. For me it’s a great way to share links to content and find links to content, but it’s not a great platform for communication, so I also have a Facebook page which I find much more suitable for that. So that’s it. 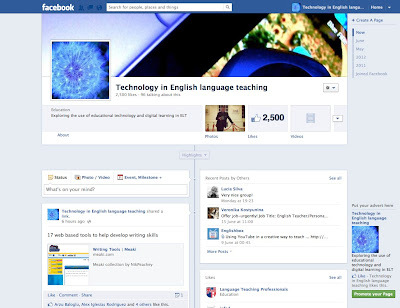 My social network for professional development. It does take time to build up something like this, but it can grow organically just by registering on a few sites and then putting in 5 or 10 mins whenever you have time. In the long run, that’s far more time economical than going to a conference and certainly much cheaper, and best of all the network you develop is one that is absolutely specific to your own needs, so what could be better. I’ll finish with a word of advice. This process can become quite addictive, especially for the social attention it can bring to you, as you start to accumulate hundreds or even thousands of followers, but don’t let feeding this network take over as the purpose of the process. Always try to retain your integrity and focus on quality. Have high standards - If you don’t find anything useful or interesting to share or write about, then have a day off, never share something unless you have genuinely learned something from it and feel it has value. WOW !! This is really very useful !! I spent a whole day reading this article and going back to explore sites I have joined but neglected soon afterwards, not getting to know the real potential of them !Before reading this article, I was searching for a way to spend my summer vacation in the best way of professional development !! Now, I found it in this article. It will be a key to a new stage in my PD !! Thanks a bunch. I really appreciate all your contributions to other teachers !! Wishing you all the best forever !! Hi Nik. This is a great blog post - especially as I'm at the stage where I need to sort all my links and resources out. I've been looking for ways to organise myself more efficiently, now I'm on holiday, and this is a great starting point. Thanks very much! I'm going to put time aside to try to follow your lead and organise my own professional development.